Whether you have a high volume of consumer debt or large commercial debt backed by RMS name, often gains the attention needed to get the debt paid. In most cases, we are able to collect your receivables more efficiently and tactfully to settle the accounts without hampering the customer relations. 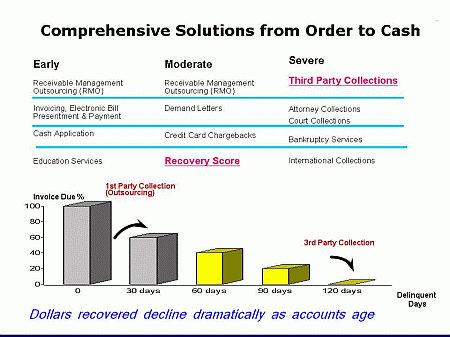 Within RMS' unique organizational structure, collection activities are separated into a customer services and collection function. Every customer is assigned with a Customer Care Representative as a single point of contact. The Customer Care Representative is responsible for handling any operational issues, coordinating activity on accounts, maintaining communications and providing the customer with reporting. This allows our highly trained collectors to dedicate themselves solely to interfacing with debtor.